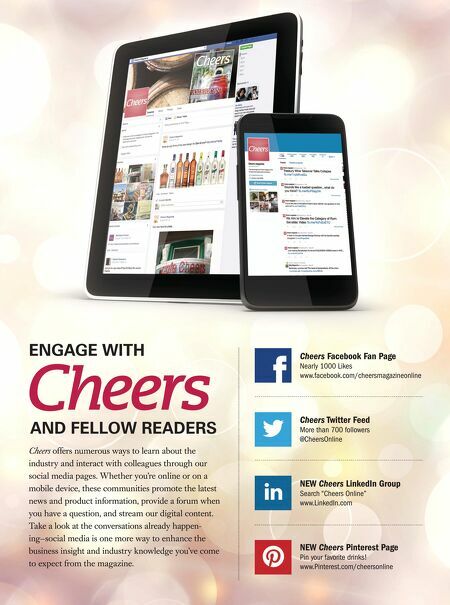 www.cheersonline.com 36 • March 2015 2015 GROWTH BRAND AWARDS – WINE COMEBACK BRANDS WINES (thousands of 9-liter cases) '13/'14 Brand Supplier 2012 2013 2014p % Change Chateau Ste. Michelle Ste. Michelle Wine Estates 2,780 2,753 3,035 10.3% La Fiera Winesellers 54 49 61 23.4% (p) Preliminary. BOTA BOX DFV WINES FAST TRACK 2014 Cases sold: 3.05 million (+21.3%) "Modern-day wine consumers want a more approachable, everyday drinking wine that offers a softer, smoother and more fruit-forward profi le,' says Mark Koppen, brand director for Bota Box. "Bota wines fi ll that niche. The core wine consumer population also wants an accessible wine that pairs with a wide variety of foods at the dinner table." The company's pinot noir and sauvignon blanc are hitting broad distribution this year, joining the 1.5-liter Bota Brick, which launched within the past few months. "We've also retained a new integrated public relations agency to expand our "Here's to Your Next Adventure" campaign in content-driving mediums, both online and offl ine," Koppen says. RIONDO RIONDO USA FAST TRACK 2014 Cases sold: 499,000 (+23.7%) Riondo is looking to on-premise to compete with big prosecco brands that aren't from Italy, says John Blesse, vice president of Riondo USA. "The sparkling consumer is extremely brand loyal, and we look forward to securing our long-term consumer base via quality and price." The company last year benefi ted from its long-term commitment to key retail accounts and on-premise accounts like Blu and Spago 187. "The on-premise focus has led to our greatest growth amongst our proseccos," Blesse adds. EPICA SHAW-ROSS INTERNATIONAL IMPORTERS RISING STAR 2014 Cases sold: 36,000 (+38.5%) Epica underwent a packaging redesign in 2013, which updated the bottle and the case graphics. "The new packaging is imaginative and strong, with graphics that lend themselves to display," says Nick James, vice president and senior brand manager at Shaw-Ross International Importers. The brand has also strengthened its consumer offers with year-round activities, such as the use of Go Pro Cameras, "which are very much in line with our consumer profi le, to a contest inviting them to become 'The Face' of Epica in 2016," he adds. Epica will also continue to invest heavily in tastings, which James says has been a key to the brand's success. Gnarly Head this year plans to use mobile-infl uenced, in-store sales driving platforms. It's a category that the brand believes will grow tremendously in the next few years as mobile applications allow rich communication with consumers and drive traffi c into retail locations. GIVING CONSUMERS A TASTE Soleil Mimosa's key to success is simple: "We believe that our most effective marketing and promotion programs have been to get our wine into consumers' hands," says Sandra Pacheco, national sales director for Southwest Wines. "We've done that by working with our retail and on-premise partners to conduct demonstrations and tastings, where consumers are able to taste the quality of our product for themselves." Ron Barcelo has seen similar success with its tasting program. "Barcelo was promoted through tastings in both the on- and off-premise in key markets," says Nick James, vice president/senior brand manager, Shaw-Ross International Importers. "We believe the quality of the product speaks for itself once consumers experience it." 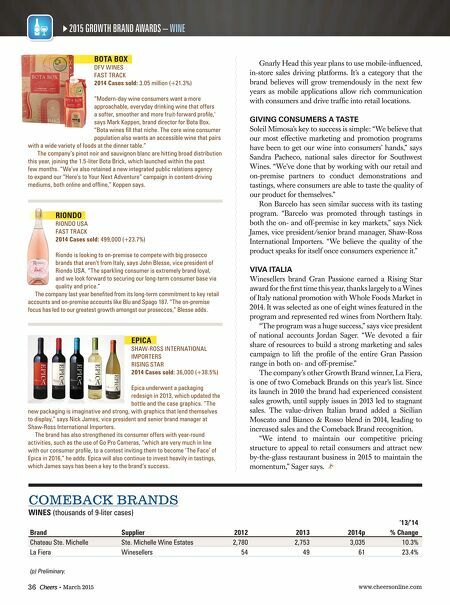 VIVA ITALIA Winesellers brand Gran Passione earned a Rising Star award for the fi rst time this year, thanks largely to a Wines of Italy national promotion with Whole Foods Market in 2014. It was selected as one of eight wines featured in the program and represented red wines from Northern Italy. "The program was a huge success," says vice president of national accounts Jordan Sager. "We devoted a fair share of resources to build a strong marketing and sales campaign to lift the profi le of the entire Gran Passion range in both on- and off-premise." The company's other Growth Brand winner, La Fiera, is one of two Comeback Brands on this year's list. Since its launch in 2010 the brand had experienced consistent sales growth, until supply issues in 2013 led to stagnant sales. The value-driven Italian brand added a Sicilian Moscato and Bianco & Rosso blend in 2014, leading to increased sales and the Comeback Brand recognition. "We intend to maintain our competitive pricing structure to appeal to retail consumers and attract new by-the-glass restaurant business in 2015 to maintain the momentum," Sager says.